Sprinkle both sides of pork chops with seasoned salt, thyme, garlic powder and pepper. In 12-inch skillet, heat oil over medium-high heat. Add pork chops; cook uncovered about 5 minutes until bottom sides of pork chops are browned. Turn pork chops; reduce heat to medium-low. Cook uncovered 5 to 10 minutes longer or until pork chops are no longer pink in center. Remove from skillet to serving platter; cover with foil to keep warm while preparing sauce. Add cider and brandy to skillet. Heat to boiling, stirring constantly to loosen browned bits from bottom of skillet; reduce heat to low. Add butter, simmer uncovered, stirring frequently, 1 to 3 minutes or until slightly thickened. Serve sauce over chops. 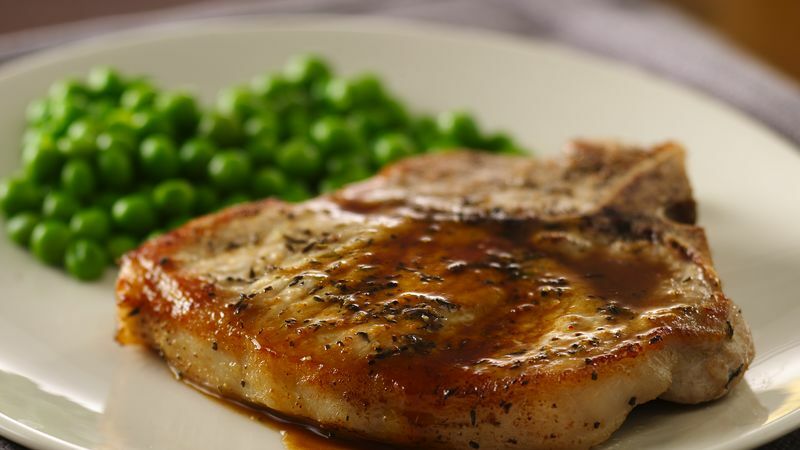 Substitute use 4 bone-in pork loin chops, 1/2 inch thick for the boneless chops. Cook pork chops uncovered about 5 minutes on each side or until browned. Reduce heat to low. Cover and cook about 10 minutes longer or until pork chops are no longer pink in center. Make pork chops and keep warm as directed above. Add 1/4 cup dry sherry to skillet. Heat to boiling, stirring constantly to loosen browned bits from bottom of skillet. Stir in 1/2 cup whipping cream, 1 tablespoon country-style Dijon mustard, 2 teaspoons chopped chives, 1/8 teaspoon salt and 1/8 teaspoon ground black pepper. Simmer uncovered, stirring frequently, 3 minutes or until slightly thickened. Serve sauce over chops.